Supriya Parulekar is a published author with four books already hitting the bookstores and has written story, screenplay and dialogues for two movie projects that are under consideration. She has also worked as a script editor for TV18, History Channel. She was a columnist for ‘YUVA’, a magazine for the youth. Her passion is reading, writing and travelling to new places in search of inspirations. Her debut novel ‘A Soulful of Life’ was a supernatural thriller which was followed by ‘Dreamcatcher’ which was romantic fiction. Her third work, ‘The Gangster’s Muse’ was a thriller and is available online and in stores. The last book was, “BFF: Best Friends Forever” and it was a great success in the category of teen fiction. Next up is ‘Darkness Within,’ a dark, psychological thriller with a sprinkling of verses setting the mood for the thriller. 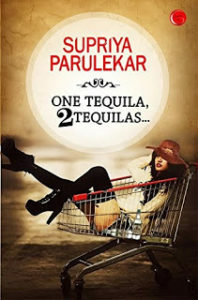 “One tequila, 2 tequilas…” is a story about two people who are as different as chalk and cheese but eventually they come together via the bond of love. The protagonist of the story is Kosha, who is smart, intelligent, confident, wild, rebellious, devoted tequila drinker and ‘anti-love’ person. Opposite her, is Siddharth, who is calm, self-composed, health freak, eager beaver, with a personality that none can resist. The story runs in the flashback when Kosha was in her young twenties and decides to elope from her engagement, leaving the groom, Harsh Sarabhai, at the altar. The sole reason that Kosha gives for ditching Harsh is that she does not feel right with him. Kosha’s beliefs on marriage and love are gloomy, which are a result of her sister’s tragic death. She confides everything to her grandmother, but lately, her grandmother has been in the semi-comatose state as an aftershock of her sister’s death news. The story describes the chain of events that take place during Kosha’s photography expedition with Siddharth, how they become fond of each other, how they cannot resist each other’s presence and how, eventually, they fall in love. The only obstruction in their path is Harsh, the fat cat, who is Siddharth’s cousin and equal partner in his business. The shrewd and wicked cog in the machine tries his level best to win back Kosha, not because he loves her but because of some obscure motives. Will the two lovers decide their fate together or will they accept the circumstances as they are? Read “One tequila, 2 tequilas…” to unveil the climax. “Fate controls who walks into your life, but you decide who you let walk out, who you let stay and who you refuse to let go.” The saying fits best with the plot of this story. The characters are well crafted. The readers are compelled to enter into a parallel world of imagination where each chapter is happening right in front, somewhere in the subconscious mind. Somewhere the book contains shades of romance that remind the readers of “Mills and Boon”. The author has perfectly mastered the task of keeping the attention of the readers transfixed such that it becomes difficult to put the book down and take a break. The personality, of all the characters, is admirable, be it daunting one or charming one. The proofreading, use of expressions and the narration is perfect. Lucidity, continuum, drama; are some of the adjectives that fit right into the plot. The cover of the book is mesmerizing and goes with the title pretty well. Overall, a recommended book for all those who are all ears and eyes for romance and passion. Kudos to the author for portraying the emotions so well. There are some printing errors like Dhruv has been spelt as Dhruva.